Businesses that require maximum speed utilize Nextera’s T-1 service, the industry leading broadband service choice for businesses. Business T-1 combines voice and data on single circuits which maximizes efficiency and provides the flexibility needed in today’s competitive business world. For those businesses that rely on e-commerce, CRM solutions, online data storage, or other high-bandwidth applications, Nextera delivers either bonded T-1s or fixed 4G WiMax (wireless) to ensure the continuity of these mission critical applications. Bonded T-1s deliver up to 6Mbps of symmetrical speed in an affordable, seamless connection and WiMax delivers up to 100Mbps or more in a reliable, symmetrical wireless format. These Nextera options offer solutions for every business type and size. A single Integrated T-1 is 1.544Mbps of bandwidth. This commonly used service is connected directly to a PBX or Key System. Each 64kb channel can be configured with either PRI interface or CAS interface with either voice or data to maximize efficiency for every business. Nextera’s Integrated T-1 has a standard set of features as well as optional a la carte services. The T-1 connects directly to your phone system (PBX or Key System) so there is no new equipment to purchase. 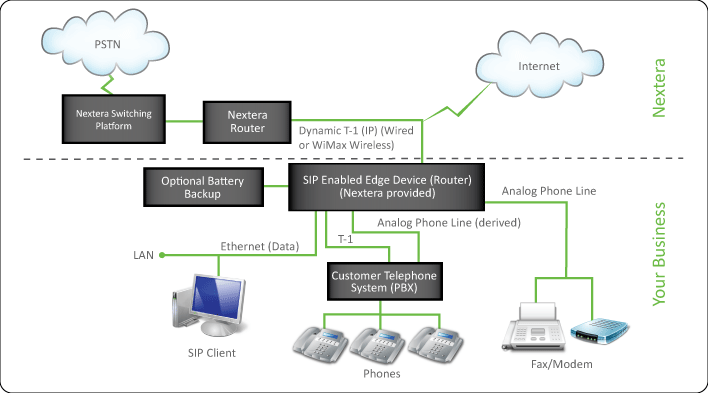 Nextera provides the flexibility of either CAS or the most common ISDN-PRI. Easily upgrade as your business grows by bonding up to 4 T-1s together for 6Mbps of bandwidth. Variety of long distance plans per minutes or shared company-wide buckets of minutes. Derived Analog Lines (lines utilizing channels off the T-1 with analog interface). Typically used for fax, modem, credit card, alarm or analog phone system. One usable Static IP Address with option to purchase additional. Inbound only, Outbound only, or 2-Way voice trunks. Buy one circuit (or bond multiple circuits) that share both voice and data traffic. Business class performance with the reliability businesses demand. Providing 1.544Mbps of symmetrical upload and download speeds per circuit. No waste - buy as many or as few channels as needed. Efficiently manage your growth by activating additional channels as the need arises. Professional installation of both wireline and WiMax allows you to be up and running quickly and seamlessly. Single provider, one bill for all your internet and voice needs. T-1 Failsafe allows calls to forward to a customer-selected telephone number when the T-1 facility is unavailable. VPNs (virtual phone numbers) available in select markets- give your business a virtual presence with local numbers that forward to your primary location. Toll-Free Numbers allow callers to dial a telephone number without being charged for the call. The toll free call is billed to the receiver of the call. Account Codes are available and can be from 2 - 6 digits in length. Account Codes can be with or without name association on the bill. Conferencing provides customers with a Meet Me type of conferencing where the moderator controls the conference by use of a secure password The moderator has the capability to monitor, control and record the call via an on-line interface. Participants can access the conference by using a participants code provided by the moderator. Auto Attendant gives you the look of a big business by providing an automated receptionist that answers your incoming calls. You have total control of the personalized messages and what options are available for the caller. You can also create different options depending upon whether it is within your business hours, after business hours and weekends, or holidays. Extreme flexibility and versatility. Website and Domain Hosting packages are available to suit the needs of any business with three packages to choose from. All sites are hosted in our secure, monitored data center. A Flex (Dynamic) T-1 is 1.544Mbps of bandwidth that is a converged voice over IP (VoIP) solution that provides channelized service to connect to a PBX or Key System. Channels can be compressed to accommodate up to 39 simultaneous voice calls per T-1 or can be uncompressed to accommodate 16. Each channel can be configured for voice or data. When voice channels are not being used, they “burst” to allow for data needs. Two types of facility are available with the Flex T-1 being wireline as well as our WiMax (wireless). With wireline facility, combine (bond) 2 or more T-1s to increase bandwidth, allowing you 3Mbps or 4.5Mbps of bandwidth with any portion available for voice and the remainder for data which then would "burst" to the full extent available. With WiMax, choose any amount of bandwidth, even up to 100Meg or more, to utilize for your combination of voice and data. Flex T-1 has a standard set of features as well as optional a la carte services. Nextera’s Flex T-1 works with your existing phone system, so there is no new equipment to purchase. Derived analog lines are available and include a large amount of standard and optional features. Inbound, Outbound, and 2-way voice trunks. Caller ID with Name and DID capability. Buy one circuit that shares both voice and data traffic. Provides dynamic bandwidth allocation. The Flex T-1 allows the full use of the circuit to “burst” with data when voice lines are idle, however, voice traffic will always have priority so businesses get maximum utilization and value. Flexible voice options delivered as PRI channels, digital trunks or derived analog lines depending on your existing phone system. Improve company productivity and reliability with optional features such as Auto Attendant and Conferencing.